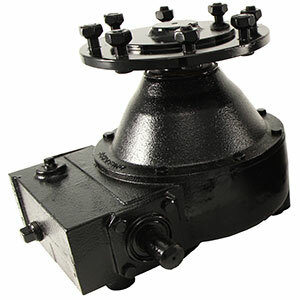 Irrigation Wheel Drives for Center Pivots made in U.S.A.
Over thirty years ago, Durst developed the original center pivot irrigation wheel drive, which has become the standard in the industry. Today, Durst has grown significantly through constant innovation, research and new technology and is proud to bring you a much improved, new generation wheel drive and promises to deliver it to you on demand. – Dyno-Lab testing proves the new Durst-Designed A1339 wheel drive is 30% stronger than the competition. – ISO 9000 registered factory featuring rigid quality control standards. – Date Coded unit for accurate warranty. – Ductile iron end caps. – 42 cubic inch air expansion chamber, the industry’s largest. – 1045 steel worm shaft. – Cartridge seals on both the input and output shafts. – One-piece, 2 1/4″ high strength ductile iron output shaft. – Standard dual input shafts, no more left and right gearboxes. – 52:1 gear ratio with a 25 degree pressure angle on Model 7830. – High strength support pilot with carriage bolts and nuts. – Model 7830 is a direct replacement for Valley wheel drives. – Filled with extreme duty gear oil. – 13 hole universal mount bolt pattern. – Model 7824 is a direct replacement for all brands of systems using a 50:1 gear ratio. Available in multiple gear ratios: 1750 rpm 50:1, 1750 rpm 40:1, 3500 rpm 25:1 and 3500 rpm 20:1. 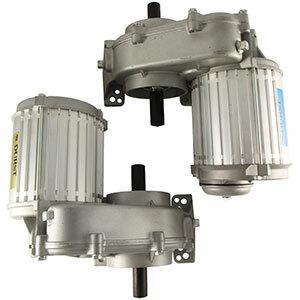 Motors are available in high torque .75 hp @ 1750 and 1.5 hp @ 3500 RPM. – Integral heat-treated pinion gear on motor shaft. – Aluminum motor frame is sealed at junction points. – Exclusive steel sleeved bearing seat. – Case hardened helical gearing. – Corrosion resistant finned aluminum motor frame. – Double output shaft seals. – Crop guard integrated into the gearbox housing. – 8 hole, universal bolt pattern. – 460/380 Volt, 3 phase motor, 60/50 Hz. – Motor is thermally protected with automatic reset. – Three condensation ports on the motor module. – Motor module interchangeable with Valley unit gearbox module interchangeable with Valley unit. – UL & CSA Certified.